Inside the LEO Doghouse: Start Me Up! A number of years ago, I decided that I needed to read all of the great books that my educational journey had somehow missed along the way. It is, of course, only well after one makes such an idiotic declaration and subsequent commitment that one recognizes the inherent idiocy in such a thing. The bottom line is that there are a lot of really, really good books out there. A whole lot. Lots and lots. And so, nine years into the effort (note that my idiocy has always been equally matched by my tenacity – not generally a good mix), I just recently read “The Grapes of Wrath” by John Steinbeck. 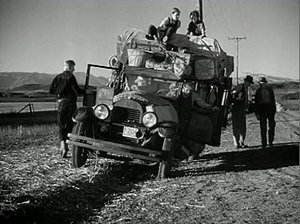 In one scene, Tom Joad can’t start their Hudson Super Six converted sedan/truck because the battery charge is too low. So his brother, Al, gets out and fits the hand crank to the crank case and they start the engine with good, old fashioned elbow grease. 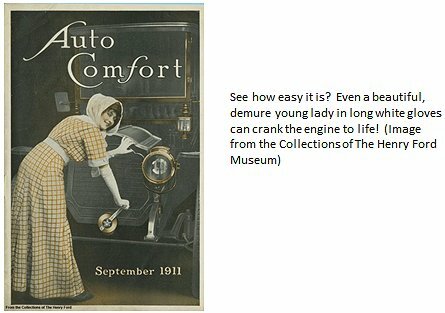 While modern cars no longer have provisions for hand cranks, it occurred to me that there used to be at least three different ways to start a car. You could use the electric motor, i.e., the starter. You could use the hand crank. Or, you could get the vehicle rolling and pop the clutch (a compression start). I only have one of those three choices with my current vehicle, but the whole topic got me to thinking about the different means by which we start rocket engines rather than automobile engines. Just as with automobiles, there are different ways to start rocket engines and which way you choose is dependent upon the mission and circumstances of the start. Some questions to ask include where do you intend to start the engine? Will it be on the surface of the earth or the surface of the moon or somewhere in space in between? Another question to ask is how many times within a mission does the engine need to be started? And, getting down to the details, what are the propellants being used and what is the engine cycle? Once you can answer these questions, then you can start to do trades studies with the stage and, ultimately design your start system. Okay, but when we say “start system” what do we mean? For combustion engines, whether it is a rocket engine or an automobile engine or a jet engine, what you need to start are fuel and oxidizer mixed and in the correct environment and, if necessary, an energy bump for ignition. In an automobile, the oxidizer comes from the air (gaseous oxygen) and the fuel comes from the gasoline tank. The fuel and air are either made into a combustible mixture in the carburetor or, if you have fuel injection, they are mixed directly in the cylinder. 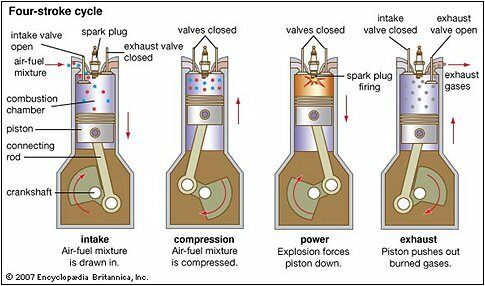 The optimal environment to get power out of the combustion is when this mixture is at an elevated pressure and so you have the moving piston within the cylinder compress the mixture before the spark plug provides the energy bump necessary to ignite the mixture. Once ignited, the mixture undergoes a rapid chemical reaction that releases energy to push the piston down in the cylinder and, in concert with the other pistons strategically placed along the crankshaft, move the automobile forward. All of the principal parts of the process are necessary in order to make the engine work. Gasoline all by itself isn’t of much use. A puddle of gasoline, even in the presence of air doesn’t make for much more. Now, if you drop a match into a puddle of gasoline sitting in air, then you’ve got a fire and lots of heat, but you don’t really have the explosive power that you need to move a car. What you need is a good mixture between the gas the air, meaning that you have as close to a uniform mixture between the two and you need that mixture pressurized before ignition. Thus, you need to have the fuel and oxygen delivery systems working and you need to have the pressurization system going and you need to have the well-timed spark to initiate the chemical reaction. In an automobile, the feed system and the timing of the spark are all tied to getting the crankshaft moving. So, once you’ve got the crankshaft spinning, the rest kicks in pretty much automatically. That’s why you can start a car with an electric motor (normal start) or, if you have a manual transmission, by dropping it into gear once the car is rolling (using the motion of the car to get the shaft moving), or, as in “The Grapes of Wrath,” by having your brother hook up a hand crank and giving it a good heave ho! Each method is intended to get the shaft spinning, initiate the propellant feed system, and provide the timely spark. The “start system” for an automobile is that which gets the shaft spinning. A standard large bi-propellant liquid rocket engine is startlingly similar to an automobile engine with regards to what’s necessary to get the thing started. When I say “large bi-propellant,” I’m distinguishing the larger rocket engines that we normally discuss here in the blog from little thrusters used on spacecraft. Very often these thrusters are monopropellant meaning that they consist of a tank feeding a chamber where the single propellant decomposes or vaporizes and then accelerates through a throat and expanding nozzle. For such a system, “starting” amounts to not much more than ensuring that the propellant tank is pressurized and then opening a valve. Also, I should mention that there is whole class of small bi-propellant thrusters that use hypergolic propellants. These propellants combust spontaneously when they come into contact with each other. There’s still an oxidizer and a fuel, but you don’t need any spark or fire to get them going. Because they are low-thrust rockets, small bi-propellant engines typically use pressurized tanks to feed the propellants into the combustion chamber. There the propellants meet, react, and generate hot voluminous gases directed through a nozzle to make thrust. The start system, as with the monopropellant rockets, is a set of valves. The hypergolic propellants themselves take care of the rest. Side note: Hypergols (that’s the German rocket scientist word from the 1940’s that led to our word “hypergolic”) are almost without exception nasty substances. If you have a hypergol spill on the launch pad, for example, you usually have to evacuate all personnel and send out a special clean-up crew. Hypergols are used a great deal in the manner shown above for our launch vehicles when thrust needs are higher than what can be provided by the little monopropellant thrusters, but not so great that the system needs to have something like an RL10. However, the Soviets/Russians/Ukrainians have built some extremely pump-fed and powerful hypergolic engines, one nearly as powerful as the F-1 in terms of thrust. They still use some of them today. Also, the Chinese use hypergolic propellants for launch vehicle primary propulsion. That’s not something that we typically do here in the United States. Indeed, we have whole programs dedicated to figuring out how to be less dependent up on such nasty propellants. However, because of the inarguable simplicity and resulting high reliability of this kind of rocket, this was what was used to launch the crew module off of the surface of the moon during the Apollo Program (LMAE – Lunar Module Ascent Engine built by Bell Aerospace and Rocketdyne). Sitting on a celestial body other than Earth is not any place where you want to question the likelihood of having your engine start so you make it as simple as possible (and, besides, the local residents don’t complain much about the noxious plumes). 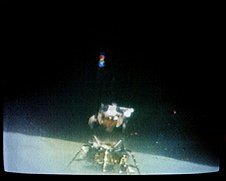 Apollo 16 ascent from the lunar surface 23 April 1972. On board were John Young and Charles Duke. They were met in lunar orbit by T.K. Mattingly. That then leaves what I really want to talk about and that’s start systems for big rocket engines, bi-propellant and pump fed. So, as I was saying, what you need to start a rocket engine of this class is startlingly similar to what you need to start an automobile. You need fuel and oxidizer, in the right conditions, and you need something to start the combustion. So, how do you get propellants into your combustion chamber? In a large pump-fed system, your stage propellant tanks are typically not designed for very high pressures (since that would make them far too heavy for flight) so if you just rely on a pressure differential to push the fluid, it’s not going to move very fast. However, there are engines that do actually perform engine starts using only what the tanks have to give the engine. The amazing RS-25 (formally the Space Shuttle Main Engine) is one such engine. The very early portion of the start sequence relies only on pressure in the propellant tanks and the pressure resulting from being in a gravitational field (head pressure = ρgh) to feed propellants into the preburners that drive the turbopumps. Then, once the engine gets a little fire going there and starts to provide power to the turbopumps, they take over authority and control as the system comes up to full operating pressures. Another engine that starts with only tank pressure is the RL10. This is quite impressive when you realize that the RL10 starts in space, with no help from gravitational head pressure. It’s also impressive since the RL10 is an expander cycle engine meaning that what is used to drive the turbine is gas heated through the regenerative cooling passages of the combustion chamber. But when the engine just starting, there is not yet any fire in the combustion chamber so it’s using only whatever residual heat in the metal to provide the energy to get the pumps going. Since the RL10 has to start multiple times within a given mission, you can imagine how the shutdown from the previous start might have an influence on the next start. Shutting down with everything cold is generally the safest way to go, but if you leave everything too cold, then you might not have enough residual heat in the system for the next start. 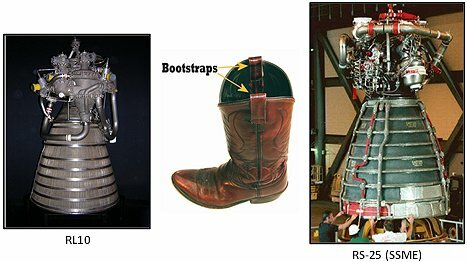 In both cases, for the RS-25 and for the RL10, this process of starting with only low pressure propellants and relatively slowly building up pressure is called “boot-strapping” (as in “pulling yourself up by your own bootstraps”). In order to get a more powerful start sequence you can use what is known as “spin start.” A spin-start system uses a high pressure or high energy gas to get the turbines spinning prior to the rest of the start sequence. This effectively pre-pressurizes the whole system. There have been different gas sources designed over the years for spin start. The original J-2 had a small, high-pressure tank built right onto the engine. 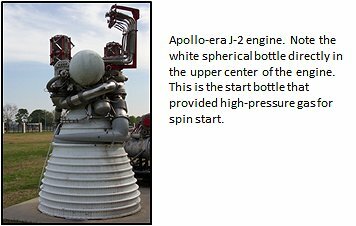 For the S-IVB stage (the Saturn V vehicle third stage), after engine start and during operation, the J-2 engine re-filled the start tank with high pressure hydrogen. This refilling was necessary since an engine restart was necessary for the kick firing that sent astronauts to the moon. An experimental engine derived from the J-2 in the 1970’s called the J-2S used solid-propellant gas generators as the spin-start source. These were, just as the name implies, little solid propellant rockets that put out a lot of hot gas for a short duration, just long enough to get the turbopumps spinning, typically only a couple of seconds. For J-2X, we considered both the J-2 and the J-2S options for spin start. In the end, however, we chose a third path. The J-2X engine uses very high pressure helium supplied by the vehicle stage as the spin-start gas. Note that for the J-2, J-2S, and J-2X engines the spin-start gas is fed directly into the same turbines used during engine mainstage operation. A frequent design approach used for Soviet and Russian rocket engines is to have a separate, dedicated, and optimized spin-start turbine on the same shaft as the primary turbine. This approach is generally best suited for kerosene engines since it is quite common to have the liquid oxygen and kerosene pumps on a common shaft. Whether you choose to design a boot-strapping system or a spin-start system is a decision with a number of variables and considerations. A boot-strapping system is nice since you don’t have any auxiliary start systems to worry about. But often, in order to get such a system to work, the system valves need to be very carefully manipulated to keep the boot-strapping process going. Well, that careful valve manipulation implies a more complex valve actuation system than just simple open-closed valves. On the other hand, you could go with a spin-start system, use a simpler valve actuation system, and possibly get more powerful, faster, and more repeatable engine starts, but then you’re paying the price in vehicle performance for having to carry along an additional auxiliary system. P.S., Just in case there is any confusion … that video was not real. It was assembled by our own Dennis Olive and David Reynolds (both MSFC) several years ago when we were testing the J-2X workhorse gas generator. Author wdgreenePosted on December 19, 2013 Categories Liquid Rocket Engines57 Comments on Inside the LEO Doghouse: Start Me Up!